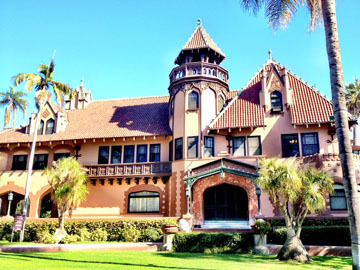 DOHENY MANSION reflects the wealth and social status of oil baron Edward L. Doheny and his wife Carrie Estelle. Before there was Beverly Hills, the wealthy and the elite settled in West Adams, the original wealthy area of the city. In the 1880s bankers, doctors, attorneys and politicians rode the street car downtown from their lavish Craftsman, Tudor and Victorian homes, the best seen this side of the Mississippi, says photographer Jett Loe. He first saw the area when looking for a home in 2012, and was surprised and mesmerized by the architecture. Expecting to find several coffee table books on the area architecture and history, he was surprised to find there were none. He raised funds from area residents and an internet campaign and set out to document the people and the lavish homes they lived in. The results are in his new photo book for iPad and Mac, “Untold LA: the Astonishing Homes of Los Angeles’ Forgotten West Adams District.” An interactive 361 pages, the book features 500 photos, videos and 70 oral histories in what is considered the most ethnically and culturally diverse area in the country. The iBook is available for $9.99 at contact@untoldla.com or visit untoldla.com.